Shocked that companies and mutual funds would invest OPM (Other People's Money) in high-risk investments, the Shocked Investor was originally on a mission to find out if our money ended up in these dubious instruments. This blog now also discusses other financial topics, such as straddles, options, gold, natural gas, agri/food stocks, and the collapse of the US Dollar. As expected with money printing, oil has climbed higher as well (wuth the drop in the US Dollar). 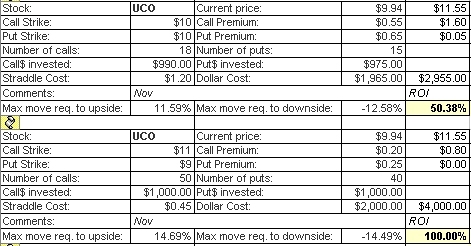 Here is the current status for past UCO straddles and strangles. Oil, through our favorite oil ETF, UCO, was a big winner. ECB: "It Is Inconceivable That The Euro Fails"
"We Serve Neither King Nor Kaiser But Ireland"